Nic’s dad shows him how to make even better burgers and he shares his newfound knowledge. Yes, I have cleaned the grill since I took this picture. I’ve written in the past about my great success in barbecuing the perfect burger. And now things have gotten even better. My dad shared a glorious, glorious tip with me recently: When making the patties, add a touch of olive oil. Yep. Simple as that. Just a little bit of olive oil. It makes the burgers infinity-plus-one juicier. To recap for new readers, do not under any circumstances purchase patties from the store. Make your own, and make them concave, like the burgers in the picture here. That way lies perfection. 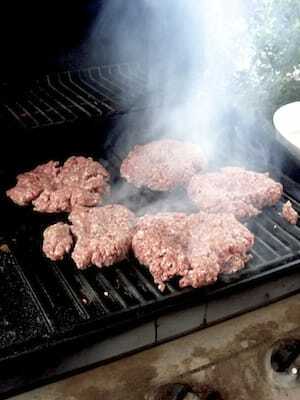 Get the ground meat out, add a bit of olive oil, then form the meat into patties—nice and thick—and make sure to make the middle really thin so you don’t have to push down with the turner during grilling. Pushing down with the turner costs you grease, and the grease is what gives you the wonderful taste. The grease is your friend. Buy good meat. If you don’t have good meat to start with, nothing you do at the grill will save you. The drawback of the added olive oil is that you will generate a lot of white smoke while grilling—like your grill has elected a new pope. But it’s worth it. Oh, so worth it.